FLOAT Studio designed the offices of mattress company Casper, located in New York City, New York. Casper’s new 34,000 SQ FT Headquarters in NYC is located at 230 Park Avenue South, FL16. The newly gut renovated space is bright, serene and ethereal. Fresh and unexpected, like their brand. We used shades of blue and natural tones to create a soft, dreamlike environment on the 16th floor, and darker more vibrant blues in their penthouse to create a sense of transition from day to night. The space is mostly open concept – flexible living rooms that can be closed off with oak pocket doors, acoustically treated meeting nooks, a quiet library, nap pods, and a large town hall area for company-wide meetings and team lunches. 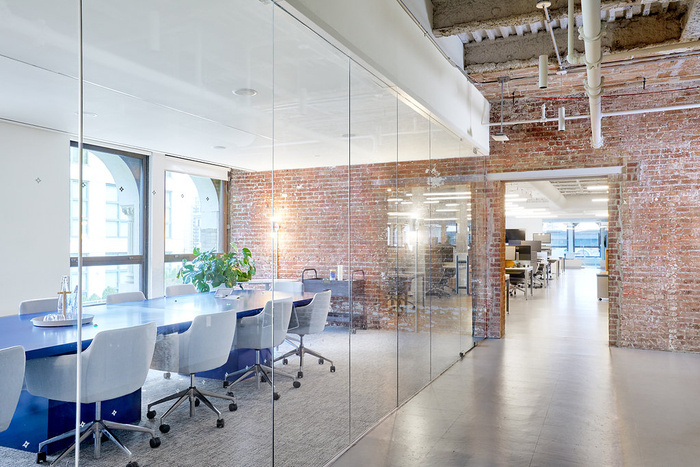 We used sustainable practices wherever we could – LED lighting, cork flooring, upholstery selections, reusing existing infrastructure and glass systems, etc.